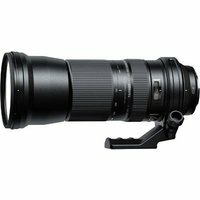 Designed for full-frame (EF) and APS-C (EF-S) format Canon DSLR cameras, the Tamron 150-600mm f5-6.3 SP Di VC USD telephoto zoom lens offers a versatile focal range in a compact, lightweight design. This powerful lens enables you to capture wildlife close up in detail or at a distance in its natural habitat, without disturbing its activity. Tamron's image stabilisation system (VC) and Ultrasonic Silent Drive (USD) allows you to shoot crisp images of fast-moving, distant subjects handheld, and is suitable for a wide range of applications, including sports, wildlife, travel, and portraits.